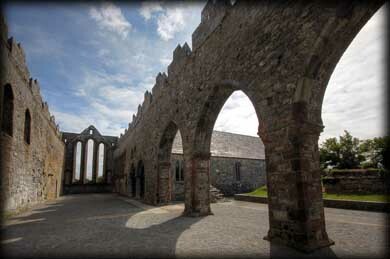 The Cathedral at Ardfert is built on the site where St Brendan founded a 6th century monastery. Most of the cathedral dates to the 13th century, but part of the North wall actually dates back to the 12th century. 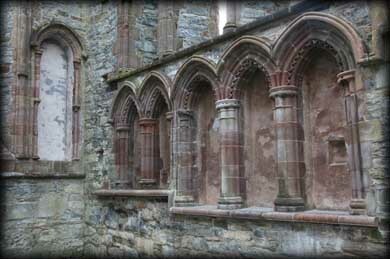 The east wall, pictured right, has three lancet windows and there are an amazing nine lancet windows in the south wall. Below these windows there is a fine sedilia, pictured below. The western wall has a beautiful Romanesque doorway, with outward pointing chevron decoration and is flanked on either side with a blind arcade. Unfortunately on our visit the doorway was sealed off due to some restoration work. The battlements were added to the cathedral in the 15th century. The south transept has been restored and is now being used as the main entrance. Some of the original carving work has been moved into the transept for protection, where there are a number of interesting items on display. These items include two wonderfully carved effigial slabs bearing ecclesiastical figures, that once stood in the arcades either side of the east window. 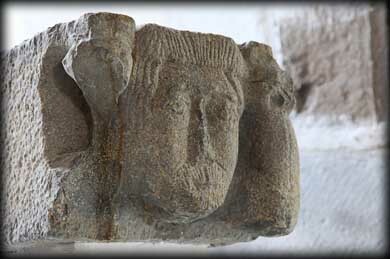 Also present in the exhibition are some head carvings including a gargoyle. Some other gargoyles are still in situ. Close to the main entrance of the transept stands a 1.22m high ogham stone. A little bit of the inscription still survives " CT (A) N QLOG ". 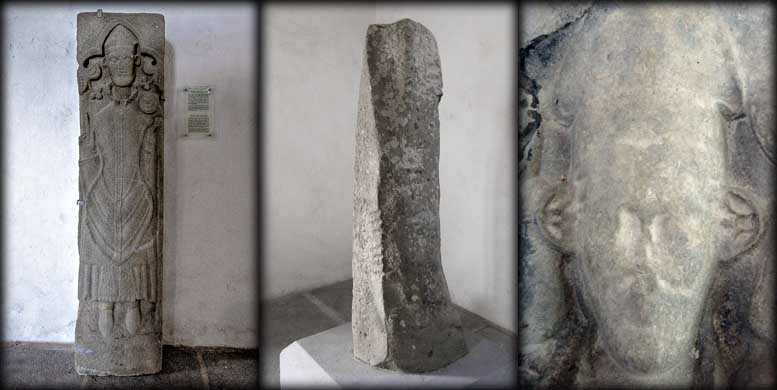 Effigial slab, Ogham Stone and head from the other carved slab. 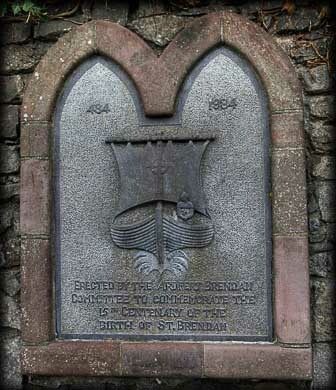 St. Brendan, aka Brendan the Voyager, was born in Ciarraighe Luachra, near Tralee , County Kerry in 484. 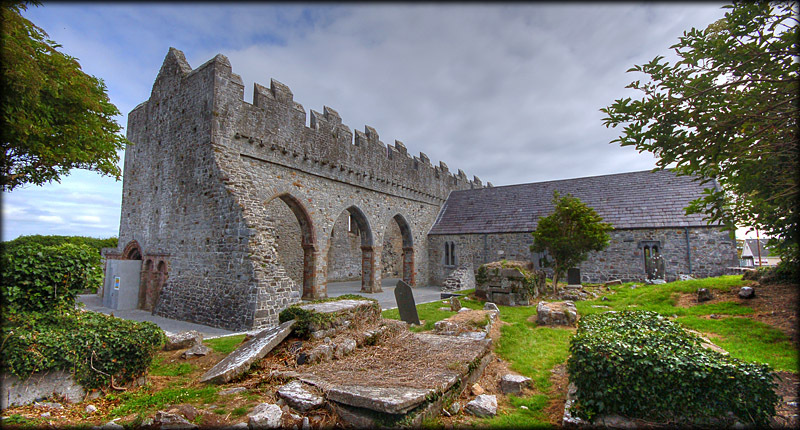 He was ordained by St Erc in 512 and established monastic cells here at Ardfert, Inis-da-druim in the present parish of Killadysert, County Clare and Baalynevinoorach, at the foot of Brandon Hill. It was from here that St Brendan set sail on his many voyages. These adventures were called the "Navigatio Brendani", the Voyage of St. Brendan. As the stories of his seven year voyage grew, pilgrims flocked to the Mount Brandon area and the early christian sites at Gallarus and Kilmalkedar developed. He also travelled to Wales and Scotland where evidence of his visit can be seen in the names Kilbrandon and Kilbrennan Sound. After three years in Britain he returned to Ireland and established churches at Inchiquin in Galway and Inishglora in County Mayo. 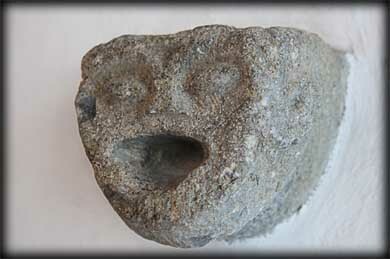 He also founded the See at Annaghdown in Galway, where he died in 577. 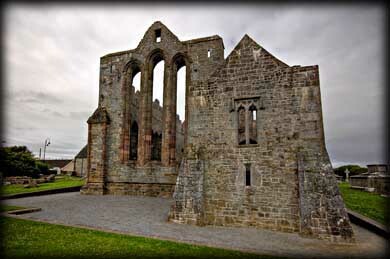 He was interred at Clonfert in Galway his most celebrated Foundation. Situated: Very Easy, located in the centre of Ardfert Village 11 kilometres NNW of Tralee. Discovery Map 71: Q 7858 2116. Last visit July 2011.